If you're a gardener and your seed-starting setup has room, there's no reason not to grow your own lettuce through winter. The photo shows a crop at about 4 weeks in. Where I live now, I have very deep windowsills cause my walls are thick stone, so I have a real seed-starting station with lights in my living room. But where I lived previously, I started seeds on a windowsill and that was just fine. Wherever you have some room is fine, as long as there is enough light. This winter, I am growing 3 types of lettuce (Buttercrunch, Winter Density, Little Gem), so as to include both growing romaine lettuce and butterhead lettuce, my two favorite lettuces. I am also growing radicchio, parsley, purslane, minutina and mâche. This is easy. I set up the trays same as for seed starting, which in my case is a mixture of half manure and half peat moss with a thin layer of vermiculite on top. The vermiculite layer is where seeds actually sprout, and having the manure/peat mixture underneath means I don't need to transplant, nor futz with fertilizer during the first stages of growth. In the case of seed-starting, nothing gets fertilized until it is transplanted into the ground; for my winter lettuce, it just never gets fertilized at all as the manure is sufficient to grow the lettuce. I use twelve 6-packs in each tray. 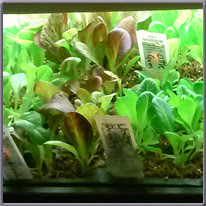 For winter lettuce, I plant thickly, about 8-10 seeds per cell, as I am growing what is a bit bigger than baby lettuce. It takes about 6 weeks to get the crop as big as it will get, so I start another tray every week for 6 weeks. I start a tray of freshly planted seeds on a heating mat, then move them under lights after they sprout. Once a week, I pull one of the six-packs out of each tray and water the tray; the peat soaks it right up for the plants. After about 6 weeks or so, I harvest each tray with scissors. A quick rinse in the colander and a spin in the salad spinner and I have mixed greens for either salad or juicing. About 2 weeks after the harvest, I'll get a second, smaller harvest from the same tray. The initial harvest gives me about 3-4 quarts of greens and the second from the same tray is closer to 2-3 quarts. Since there are only two of us here, a tray a week is enough to keep us in greens all winter. Given that lettuce is a "dirty dozen" crop with high pesticide residues, when I buy at the store, I buy organic, which gets pretty expensive in the winter. Growing my own costs nearly nothing and only takes about 10 minutes per week after the initial setup of the trays. Plus I get to choose my own varieties and thus emphasize growing romaine lettuce, butterhead lettuce and radicchio, which make up the majority of the space in each tray. You could easily use a mix if you prefer as most seed catalogs sell mixes. I'm thinking of adding dandelion to the mix next winter. Between my greens tray and a regular rotation of sprouting onion seeds, I have a lot of fresh vegetables throughout winter. Do you grow anything over winter?